Nice picture of Maui’s Kaahumanu Society officers, 1923. These are the officers of the society: Mrs. Sarah Buck, president; Mrs. Mary Ross, vice president; Mrs. Aoe Holstein, treasurer; Mrs. Keoho Rose, secretary; Mrs. Hattie K. Smyth, assistant secretary; Mrs. Magaret [Margaret] Kinney, auditor; Mrs. Becky Mounacastle [Mountcastle], Mrs. Kaumeheiwa, Sr., Mrs. Sam Alo, Miss Ellen Cropp, Mrs. George Kaholokai, Mrs. Annie Lake along the officers of the society, are the executive committee. Ka Nupepa Kuokoa, Buke LXII, Helu 27, Aoao 3. Iulai 5, 1923. This entry was posted in Illustration, Organizations and tagged Ahahui Kaahumanu, Kaahumanu Society by nupepa. Bookmark the permalink. I am a life member of Chapter 1, Lehua McColgan. This information on Queen Kaahumanu is most interesting, so much learned. Our present chapters should read about our Queen. 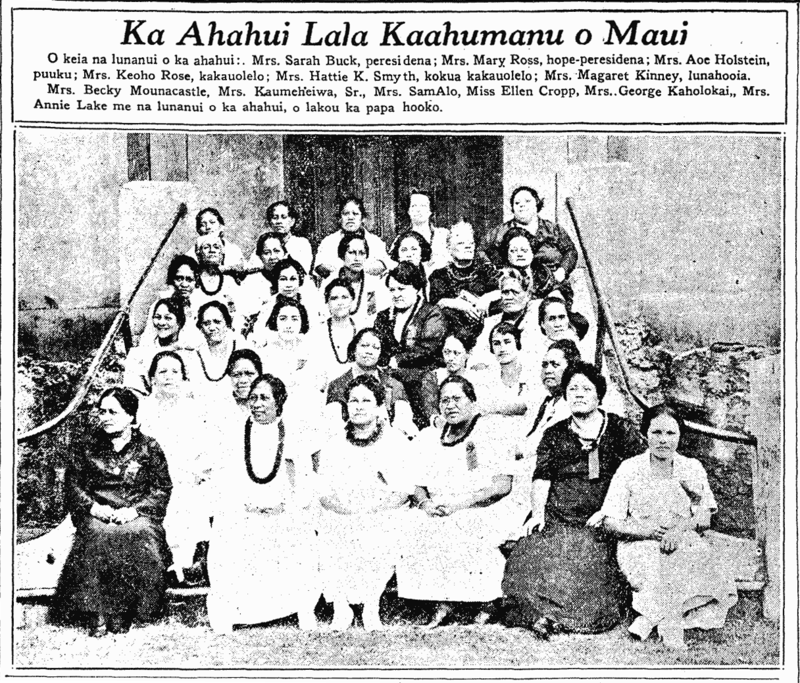 I would like to know where did the Ahahui’s song “Lei Kaahumanu” was composed, who composed such an elegant song. It should be preserved with dignity, sung by all chapter members with much pride and glory. It should not be used for hula contests, when singing this song no hula movements or any type of movement of the kino. It should be sung as a symbolic and respect for our Queen Kaahumanu. We should show honor a feeling of high respect especially before an audience allowing them to know how highly our Queen is respected for what she has accomplished in her life for all of us. OMG….I just found a letter that my grandfather wrote in 1912 this my grandfather and i saw a picture of my aunties and my grandfather…amazing. There are so many connections waiting to be made!